So can Jesus be found in the Torah? Jesus doesn’t list any specific texts here. First, we need to remember that there were other names that were used to describe the messianic person other than the “Messiah.” Some of the names include Son of David, Son of God, Son of Man, Prophet, Elect One, Servant, Prince, Branch, Root, Scepter, Star, Chosen One, and Coming One. I should also note that Dr. Alfred Edersheim in his classic work, The Life and Times of Jesus the Messiah (appendix 9) mentions that additional rabbinic opinions support the understanding that Genesis 3:15 refers to the Messiah. The point is that we see what is called the “the Proto-evangelium” or the beginning of salvation history. God was planning on doing something for the entire world. 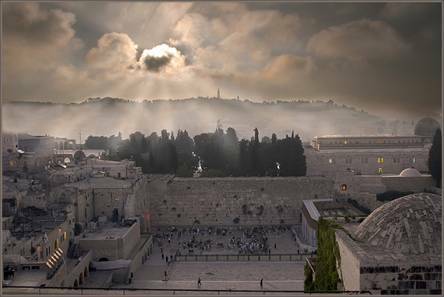 A good study of the Abrahamic Covenant shows the Messianic blessing for all the world. Hence, all peoples on all the earth – 70 nations at the time – would be beneficiaries of the promise (Gen. 12:2–3; cf. 22:18; 26:4; 28:14). The Abrahamic promise of blessing of the nations is repeated in Ps. 72:17; Isa.19:24-25; Jer. 4:2; Zech 8:13. In this passage, the servant is called “Israel,” while this figure is also distinguished from Israel as the one who will bring the nation of Israel back to God. This figure will bring “salvation to the ends of the earth.” A study of the rabbinical literature (such as The Life and Times of Jesus the Messiah by Alfred Edersheim) describes these passages as being about the Messiah. For the New Testament authors, these texts find their fulfillment in Jesus. How might Jesus be the literal fulfillment of such a passage? As we see in the Abrahamic covenant, the purpose of Israel was not to be a blessing to herself. Therefore, through her witness, the world will either be attracted or repelled towards the God of Abraham, Isaac, and Jacob. It should be no surprise that in Matthew’s opening chapter, he says,”The record of the genealogy of Jesus the Messiah, the son of David, the son of Abraham “(Matt. 1:1). The Messiah is not only of Davidic descent, but will bring fulfillment to the Abrahamic Covenant. Also, Matthew emphasizes Jesus’ mission to help Israel fulfill it’s calling (Matt. 10:5-6;15:24), as well as Jesus’ command to bring the nations into God’s redemptive plan (Matt 28:19). Micah spoke of a time when the nations would go to a restored temple to learn about God (4:15). Amos also spoke of all the nations coming to the God of Israel (Amos 9:12), and other prophets spoke of the inclusion of Gentiles into God’s redemptive plan (Ezek 17:23; 31:6; Dan 4:9-21). This is why just as Israel is called to be a light to the entire world, the Messiah’s mission is also to be a “light to the nations” (Isa. 49:6). Hence, while God’s plans are national (Israel), it is evidence that the nation is an instrument to bring international blessings. Therefore, Israel’s Head, the Messiah, is called to restore the nation and use the nation to bring blessings to the other nations of the earth—blessings that are spiritual and physical. But there is another aspect of this prophecy that remains partially unfulfilled. Apparently, an individual from Judah’s seed came who will rule over both his own nation Israel and the “peoples” of not just Israel but the rest of the world (also see Gen 17:6; Exod. 15:16; Deut. 32:8). While the immediate context probably refers to King David, it also speaks to an eschatological ruler whom the Gentile nations will come to in submissive obedience! We should note that part of this prophecy has not been fulfilled. While there are many Gentiles who have submitted to the rule of Messiah (Jesus) in their lives, all the nations are not under the universal rule of the Messiah. Keep in mind, this doesn’t mean that Jesus is not the King right now. He most certainly is. However, there is more to come in the future. God, through Moses, warns Israel to remain separate from the evil practices of the surrounding nations (Deut. 18:9-12) and instructs Israel how to tell the difference between a “true prophet” and a “false prophet.” After God had warned Israel about attempting to get supernatural information from bogus pagan sources ( Deut. 18:9-14 ), he announced that he would “raise up for them a prophet like Moses from among their own brothers” (v. 15). Any prophet who speaks in the name of the Lord and his words do not come true is a “false prophet.” God has not spoken through him. John the Baptist began to preach, he was asked, “Are you the Prophet?” (John 1:19-23). Here, we can notice the emphasis, “And I will put my words in his mouth, and he shall speak to them all that I command him.” The prophet only respeaks the words of God (cf. Jer 1:9: Isa. 59: 21). God said to Moses “Now therefore go, and I will be with your mouth and teach you what you shall speak” (Exod. 4:12). We see in the context of Numbers 16, Moses faced his opposition in that they challenged his headship and authority. Hence, they challenge the idea that Moses has a special mission and that he was sent from God. In response, Moses defends his mission in that he has never “acted on his own,” i.e., claiming for himself an authority which he did not have. Moses says, ” Hereby you shall know that the LORD has sent me to do all these works, and that it has not been of my own accord” (Num.16:28). For I did not speak on My own initiative, but the Father Himself who sent Me has given Me a commandment as to what to say and what to speak. I know that His commandment is eternal life;therefore the things I speak, I speak just as the Father has told Me” (John 12: 49-50). Do you not believe that I am in the Father and the Father is in me?The words that I say to you I do not speak on my own authority, but the Father who dwells in me does his works (John 14:10). Whoever does not love me does not keep my words. And the word that you hear is not mine but the Father’s who sent me (John 14:24). For I have given them the words that you gave me, and they have received them and have come to know in truth that I came from you; and they have believed that you sent me (John 17:8). “ See, I have set before you today life and good, death and evil. If you obey the commandments of the LORD your God that I command you today, by loving the LORD your God, by walking in his ways, and by keeping his commandments and his statutes and his rules, then you shall live and multiply, and the LORD your God will bless you in the land that you are entering to take possession of it. But if your heart turns away, and you will not hear, but are drawn away to worship other gods and serve them, I declare to you today, that you shall surely perish. You shall not live long in the land that you are going over the Jordan to enter and possess. I call heaven and earth to witness against you today, that I have set before you life and death, blessing and curse. Therefore choose life, that you and your offspring may live, loving the LORD your God, obeying his voice and holding fast to him, for he is your life and length of days, that you may dwell in the land that the LORD swore to your fathers, to Abraham, to Isaac, and to Jacob, to give them.” (Deut 30: 15-20). God says, “I will be with you. And this will be אוֹת “the sign” to you that it is I who have sent you” (Exod. 3:12). ”If they will not believe you,” God said, “or listen to the first sign, they may believe the latter sign. If they will not believe even thesetwo signs or listen to your voice, you shall take some water from the Nile and pour it on the dry ground, and the water that you shall take from the Nile will become blood on the dry ground.” (Exod 4: 8-9). We see the signs are used to help people believe. Jesus answered them, “I told you, and you do not believe. The worksthat I do in my Father’s name bear witness about me” (John 10:25). If I am not doing the works of my Father, then do not believe me; but if I do them, even though you do not believe me, believe the works, that you may know and understand that the Father is in me and I am in the Father.” (John 10:37-38). There are many other places in the Torah that point to the life and ministry of Jesus. For now, I hope these texts can spark some interest in further study. 1. Herbert W. Bateman IV, Darell L. Bock, and Gordan H. Johnston, Jesus the Messiah: Tracing The Promises, Expectations, And Coming of Israel’s King ( Grand Rapids: Kregel Academic, 2012), 46.